Материалы, размеры Холст, темпера. 49,5 х 76 см. Taos Pueblo, New Mexico, stamped with a signature, further stamped twice “Nicholas Roerich Paintings and Art Collections, Inc.” on the reverse. Tempera on canvas, 49.5 by 76 cm. Provenance: Roerich Museum, New York, USA, 1922-1935. Nettie and Louis Horch collection, USA, from 1935. Literature: Probably Roerich Museum Catalogue, New York, Roerich Museum, 1930, no. 122, listed. Roerich, New York, International Cultural Centre “Corona Mundi”, 1924, illustrated and listed as “New Mexico”. Related literature: For similar works, see N. Roerich, Arizona and New Mexico Sketchbook, 1921, Roerich Museum Archives. Taos Pueblo, New Mexico was painted in 1921 and is one of the few surviving works from Roerich’s American period. In all, we know of 15 works which he painted in the Southwest — in New Mexico and Arizona — but the actual whereabouts of only six, and a mere two of these depict the ancient Native American settlement Taos Pueblo. It is one of these two paintings which MacDougall’s is now proud to offer at auction. The legendary Native American pueblo depicted in this work, now a UNESCO World Heritage Site, became a place of inspiration for many remarkable artists, and for Roerich was one of his “hallowed grounds”. Of his two-year stay in America Roerich later remarked: “In New Mexico and in the spaces of this beautiful country again sounds for you the anthem of the East… the same note of great vision, of great wisdom.” During his stay in America, Roerich gave numerous lectures in the nation’s museums and universities in which he tried to convey the idea of a new perception in art. He was astounded by the lack of interest in other artistic traditions that he found in the United States in the 1920s. In his desire to change the situation he was instrumental in the opening of The Master Institute of United Arts, the main aim of which was to bring people together through art and culture. Simultaneously in Chicago the Cor Ardens (Flaming Heart) group was established, and in 1923 the Nicholas Roerich Museum opened in New York. Despite the fact that those two years he spent in America, 1920-1923, were filled with a flurry of artistic and academic activity, his religious and cultural research into the Native Americans inspired Roerich to create a series of particularly characteristic and instantly recognisable works. In the works of his American period he skilfully conveys the immediacy of his first impressions of America, a country to which he returned three times after his first visit. His images of the desert which brim with energy and enthusiasm are startlingly life-like. The bright palette and motifs from ancient art, which made such an impression on Roerich as a keen anthropologist and ethnographer, markedly distinguished his works. Depicted in the pencil sketches in Roerich’s albums, now preserved in his museum in New York, is not only the structure of Native American tribes, but also their ritual dances and renowned mystical “Vision Quest” ceremonies. Unfortunately, very few of these were transposed to canvas. This very fact further illustrates quite how rare the present work is. 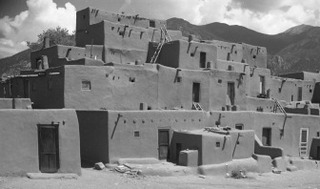 The present painting depicts the famous Taos Pueblo, which Nicholas Roerich visited in August, 1921 while vacationing in the neighbouring town of Santa Fe. (There is a well-written account of Roerich’s sojourn in Santa Fe in Ruth Drayer’s Nicholas and Helena Roerich: The Spiritual Journey of Two Great Artists and Peacemakers.) 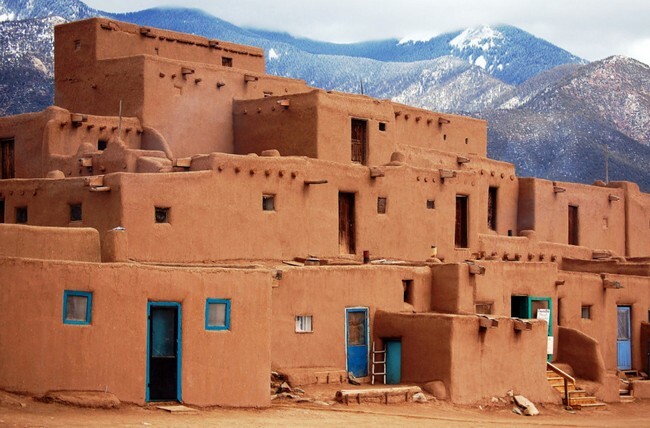 Taos Pueblo is one of a group of Pueblo Indian settlements which appeared in the thirteenth to fourteenth centuries along the path of the Rio Grande river. This Pueblo consists of adobe dwellings and ceremonial buildings, and exemplifies the traditional architectural arrangement from the pre-Hispanic period in the Americas. Culturally, it marks a significant stage in the history of ancient Pueblo people. In Roerich’s own lists of his works, there is a painting titled Pueblo from 1921 which most probably is the present work. It acquires special significance since the Taos Pueblo appears in two of Roerich’s monumental canvasses from 1923 — The Legend from the Miracle series and Vision. Both, especially The Legend, are among Roerich’s most expressive and mystical artistic statements. Both paintings touch upon the idea of the Messiah, and their iconography references the symbolism of this most cherished and profound concept in spiritual lore. Thus the presence of the Taos Pueblo in both of these works instils this American Indian setting with transcendental rather than geographical meaning. From Roerich’s writings and the accounts of his friends and followers, we know that he understood and venerated the sacred places of the world as the focal points where the energies of the Cosmos meet the Earth. His trip to New Mexico in the summer of 1921 was more than just a summer holiday. The real purpose was seeking “the harmonies of deeper insights and wisdom” at the power centres of the American continent. These visits inspired a series of his most spiritual works executed during his American period. The present painting is more that just a study of native Indian architecture. It serves as an icon, a sign pointing to a culture which emphasizes the bond between man and the natural world. The warm tones of yellow, pink and orange, which display Roerich’s mastery of subtle brushwork, convey his philosophical message. The adobe clay, an otherwise dull material, becomes a beacon of the sun’s permeating light. Set against a serene blue sky, the Pueblo emerges as a fortress and focal point of spiritual energy. We are grateful to Gvido Trepљa, Senior researcher at the Nicholas Roerich Museum, New York, for providing catalogue information.